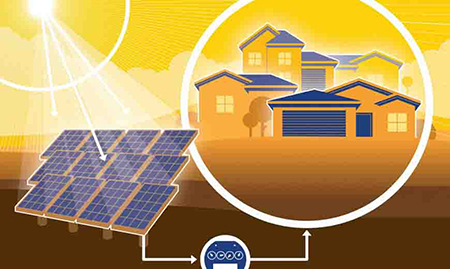 Net metering is a billing mechanism that credits solar energy system proprietors for the power they add to the grid. For instance, if a private client has a PV framework, it might create more power than the home uses amid sunlight hours. If the house is net-metered, the power meter will run in reverse to give a credit against what power is used around evening time or different periods where the home’s power utilize surpasses the system’s yield. Clients are only charged for their “net” energy utility. The advanced digital meter keeps running in both bearings to accommodate power generated at customer’s home. Net metering permits clients to produce their own power effectively and efficiently. The first and the foremost step is to get your Smart Solar Net metering compliant solar system installed. Smart Solar successfully caters to all three sectors of domestic, commercial and industrial clients. We excel in provision of small scale domestic system as 1kva to multi-megawatts industrial system. The second steps begins with preparation of application as per the rules of SRO 892 (1) 2015. This process is made easier and smooth for our valued clients by supporting them with each & every step of application preparation. The approval of application will lead to the phase of inspection carried out by Punjab Energy Department. The electrical inspection team will inspect the system as per SRO 892(1)/2015 & SOP from LESCO. After the satisfactory inspection of the system you’ll be issued NOC. This significant step will be the signing of a three years agreement between the Distributor Generator (Consumer) and LESCO. This will be a legal agreement allowing you to feed surplus energy to the national grid. The agreement signed between you and LESCO will be handed over to NEPRA for generation License. Once the legal agreement is verified by the ruling body, it will allow you to be and independent power producer for next three years. The last but not the least step involves LESCO in making you the independent power producing authority. After the successful allotment of generation license your net meter will be activated making you able to save & earn simultaneously. Net Metering benefits its users in terms of economics as well as un-interrupted power supply through a renewable energy resource. It is an empowering approach intended to encourage private investors in renewable energy. Amid the day, most sun energy using clients produce more power than they utilize; net metering permits them to sale that energy to the grid and decrease their future electric bills. Net metering gives statewide financial and economic advantages as far as employments, salary and venture is concerned. Net metering strategies make a smoother curve in terms of demand for power and permit utilities to better deal with their peak loads. By empowering era close to the point of utilization, net metering likewise diminishes the strain on distribution frameworks and averts power losses in long-distance transmission and division of Power.